The Chinese Alchemy from the point of view of this Paradigm (integrating I-Ching with Modern Physics) is presented in this Posting. The Holon formula for Alchemy, the Secrets embedded in Exotic Matter (also referred to in this Matter-Being Paradigm as Love Technology) is presented in the diagram below. At the same time, the elements illustrated inside this formula organized the nonlocal interconnections in the form of a Love Holon with detail discussion in individual postings presented in this Website. In short, this diagram captures the entire spirit of this Website. The Mind-Seasonal Connection has to do with the 10-27 formula. 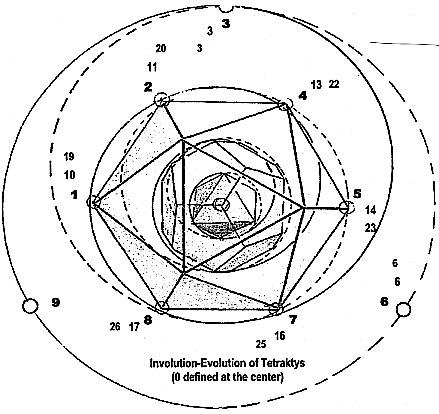 THE IN-OUT VORTEXES ARE THE INVOLUTION-EVOLUTION REPRESENTED BY A TETRAKTYS, AS SHOWN BELOW. The In Series [1, 2, 4, 5, 7, 8, 10, 11, 13, 14, 16, 17, 19, 20, 22, 23, 25, 26, …] represent the Evolution harmonic of the sphere and the Involution logic encoded in Holons [3–6–9] –> [3–3–3] holon of matter, [6–6–6] holon of Being, [9–9–9] the love holon between holon of Being and holon of Matter. I shall conclude this posting and summary of this Website with the following quotation from Joseph P. Farrell in the Philosophers’ stone: Alchemy and the Secret Research for Exotic Matter. What do NASA, the Soviet Academy of Sciences; and the Nazi Allgemeine SS all have in common? What do string theory; loop quantum gravity, or even —for the ocgnosenti — Heim theory all have in common? What do the Moon, Mars, Mercury, and the Sun have in common? And what do the three exotic substances that … the American “gold,” the Soviet “mercury,” and the Nazi “serum” — all have in common? I would add, What do the 155 Postings in this Website have in common? The Egyptian/Western research in alchemy is well summarized in Joseph Farrell’s writings. On the other hand, this Website summarized the Chinese/Eastern understanding of alchemy.